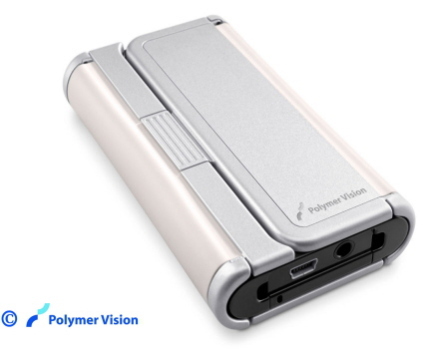 A Dutch Company by the name of Polymer Vision is set to release the world's first cell phone that features a fold-out display for viewing email, podcasts, text documents, news, and blogs. 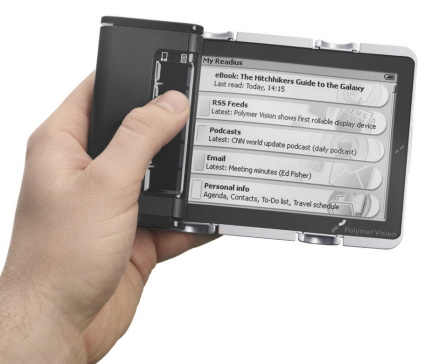 This device, called the "Readius", is the size of a typical cell phone and has a large 5-inch screen that folds out from the body of the phone. Having a fold-out display is something new to the cell phone industry, and it allows the cell phone to have a much larger screen without adding very much bulk to the phone itself. The Readius is small enough to fit it your pocket and yet it has a gigantic 5-inch screen. The makers of the Readius say, "You get the large display of e-reading, the super battery life of e-reading, and the high-end connectivity ... and the form factor and weight of a mobile phone". The new Readius is almost like a mix between the Amazon Kindle (electronic book reader) and a normal cell phone. It features a black and white screen, much like the Amazon Kindle, that almost looks like ink and paper from an actual book or newspaper. This device will be able to update any podcast, blog content, or email account that your subscribed to automatically through the 3G mobile phone network. The 3G network is an ultra-fast data network for cell phones that is a lot like WiFi for a laptop. The Readius is expected to be available in mid-2008, and there is no word yet on pricing although they will probably be priced similarly to other high-end cell phones on the market ($300-$500?). 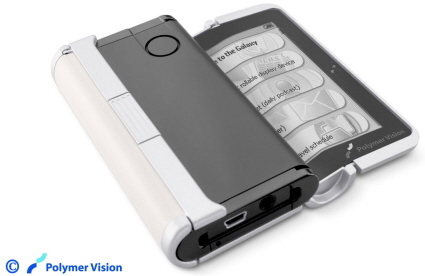 It will be interesting to see if this cell phone/e-reader will be successful in a cell phone market that is currently being dominated by cell phones with Internet connectivity, GPS capabilities, and full-color touch-screen displays. Check back for updates about this device as its release approaches. If you liked this news story, please bookmark it below. Thanks! President Obama, Please Control Your Telomeres! Years ago in the television series "Earth: Final Conflict," the main characters used a phone that looks JUST like that one. Back then I wondered, "How would that work?" Well, now I know! If it makes the print bigger than the miniature screens on all phones out there now ... then great. We're not all 17 with perfect vision. Designer Fly Swatter, A DIY Halloween Mask In Waiting!